Vintage Tom Brady was on display Thursday night. He was remarkably efficient, methodically moved the ball downfield with short passes underneath the coverage, found open receivers in the intermediate area when the opportunities were there, and never put the ball in harm’s way with both interceptions deflecting off the hands of Patriots receivers. Pass protection was excellent, and we didn’t see many big throws downfield, but it’s difficult to take much issue with Brady’s performance. Trent Brown turned in one of his better performances of the season, particularly in the run game where he generated serious movement on multiple occasions, including on a double team with Joe Thuney to spring Sony Michel on his 34-yard touchdown run in the fourth quarter. The MVP of the New England defense can be attributed to stunting pass-rushers that resulted in far too many defenders emerging free through the offensive line. Each of Adrian Clayborn, Adam Butler and Danny Shelton were able to move Luck from his spot much too frequently in the contest. A lack of a running game allowed the defense to throw exotic looks at Indy, and it kept Luck looking over his shoulder throughout the game. The New England secondary was gifted with a volume of drops to go along with allowing the Colts to actually top their offense in overall yardage. However, the factor that emerged as their ace under their sleeve was the big play. Patrick Chung collected the first mistake on a forced throw from Luck toward the end of the first half. Later in the third quarter, Devin McCourty stripped the ball from the hands of Jordan Wilkins, and a drop by Zach Pascal ended up in the hands of Jason McCourty on the Colts’ second drive in the fourth quarter. Colts quarterback Andrew Luck may have finished with excellent numbers, but his receiving group sans wide receiver T.Y. Hilton made the performance difficult. 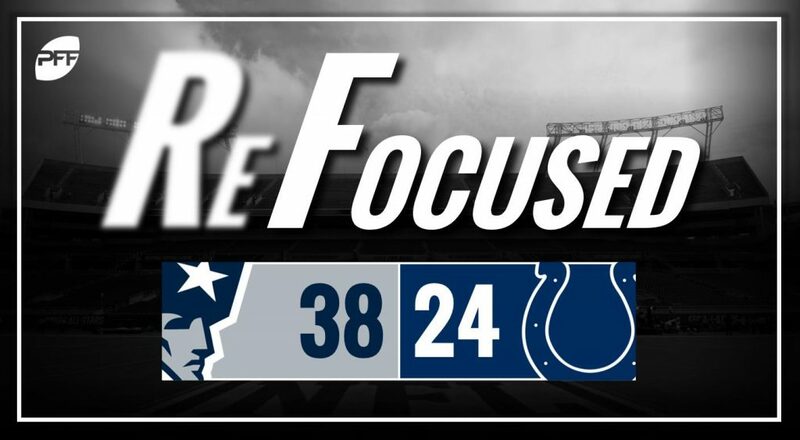 Tight end Eric Ebron, who produced a solid game, dropped his first target from Luck, and Chester Rogers dropped one of Luck’s best throws of the night early in the third quarter. Without his trusted inline option Jack Doyle, Luck and the Colts were desperate for someone to step up in the passing game. While, for the most part, the receiving corps underperformed, Ebron came through as Luck’s preferred option. Ebron eclipsed 100 receiving yards and connected with Luck on an out within the coverage of defensive back Devin McCourty for Indianapolis’ first touchdown of the game. Denico Autry was one of the few bright spots up front for the Colts’ defense, making multiple stops near the line of scrimmage in limited snaps. While Brady was looking to get the ball out quickly a good amount, particularly early on, the Colts offered very little in the way of a pass-rush. In fact, they didn’t seem overly concerned with pressuring Brady at all at times, opting to drop eight into coverage instead. There were far too many snaps where Brady was able to hang onto the ball for an eternity in the pocket waiting for coverage to break down, with the touchdown pass to Josh Gordon early in the fourth quarter a prime example. The Colts’ defense offered little resistance, allowing Brady to pick them apart while also surrendering over 4.0 yards per carry on the ground. Now sitting at 1-4, the Colts will struggle to compete this season without a running game to keep defenses honest.